Like every year, Gartner released their Magic Quadrant report for the understanding cloud computing IaaS market and available offers. Like we predicted before, Gartner gave much importance to PaaS market for the enterprise segment, however Gartner also portrayed IaaS market and discovered that one of the leaders, in addition to Amazon, is something new, while the other big brands are fighting for being on the podium. When portraying the situation of the IaaS market, Gartner found themselves facing within a diverse set of solutions, for convenience, the whole thing has been divided into platforms capable of delivering infrastructure and resources as a service and services that provide the infrastructure resources such as platforms of technology. In the latter case, Gartner has given the acronym of CESI (Cloud-Enabled System Infrastructure), but excluded them from the analysis that led to draw the Magic Quadrant. As has already happened in the past few years, as a leader Amazon AWS with its offer is significantly present as IaaS cloud provider, but, this time, in the same quadrant there are not alone. In fact, as you analyze the summary of the report, Microsoft has entered the section as leader with Azure, while other big brands do not seem to be returned among the best solutions on the market. The reason for this classification is simple and to understand the different positioning of the providers in the quadrants, we must also try to understand what these sections really represent. Gartner has grouped all those providers that stand out for strategies and roadmaps ambitious, capable of serving a wide range of needs and users, without excelling in any service area. 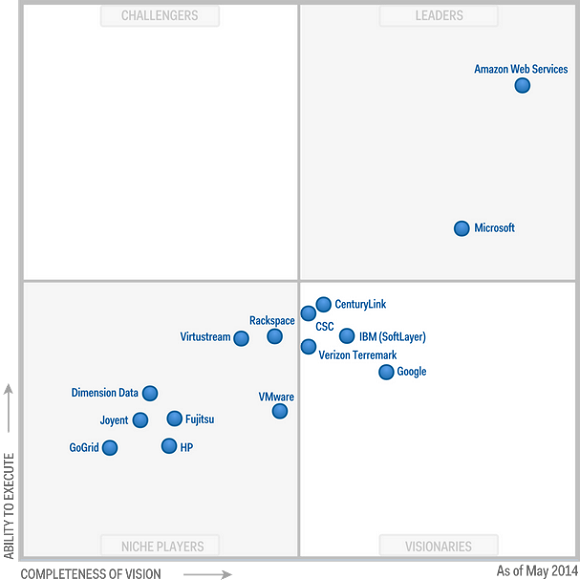 Amazon AWS is once again appears to be the most prominent in the market. Their advantages are all enclosed in being landed first on the IaaS market, detaching the opponents in front against their several years of accumulated experience in the field. Also, while other providers were organized, Amazon AWS has had the opportunity to create a thriving ecosystem of developers and partners and infrastructure in multiple areas which provide services to users. In contrast, Amazon AWS seems grown too fast and much of its success with always tending downwards pricing policy. In fact, this choice has led Amazon to ask for extra payments for options and services. Those who choose not to pay, may soon feel abandoned themselves. On the other hand, Amazon starts to feel the blows of the competition, especially from the part of Microsoft. Behind these two names, there is a plethora of providers among which there are other well-known brands, such as Google, which is gaining the ground but remains in the Visionaries section, i.e. those that have an ambitious vision for the future and are making significant investments in technology and Structural, although they are not yet able to serve with their offer an extended range of use cases. Along with Google, there is also IBM. Gartner Magic Quadrant has classified some as niche players, which includes brands such as VMware, HP, Fujitsu and Rackspace, which according to Gartner are excellent providers in which they specialize, but the recent entry on the market. This Article Has Been Shared 9746 Times! Cite this article as: Abhishek Ghosh, "Gartner Magic Quadrant 2014 and IaaS Solutions," in The Customize Windows, June 12, 2014, April 21, 2019, https://thecustomizewindows.com/2014/06/gartner-magic-quadrant-2014-iaas-solutions/.